Part 2 – Ralph Enlow interview with Kent Anderson, President of Northwest Baptist Seminary and Ruth McGillivray, Director of Competency-Based Education. Welcome to our second installment of excerpts from our interview with Northwest Baptist Seminary President, Kent Anderson, and Director of Competency Based Theological Education, Ruth McGillivray, about an innovative approach to Competency Based Education. If you missed our first post – or would like to refer back to it – click here. 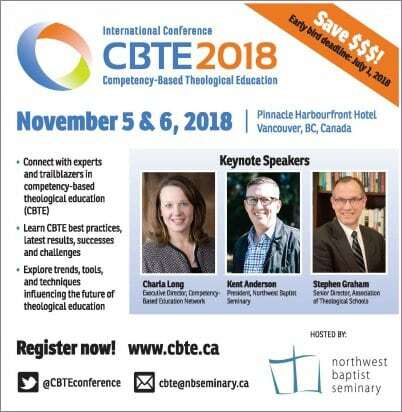 Ralph: We talked previously about the International Conference on Competency-Based Theological Education (CBTE) Northwest is holding in Vancouver, BC on Nov 5-6/18. Who should attend and what should they expect to learn? To contribute? Kent Anderson & Ruth McGillvray: We are very excited about this conference! It’s for college and seminary leaders, deans, faculty, network and church leaders, and anyone interested in the philosophy, design, and implementation of CBTE programs. We’re bringing in experts to share their knowledge of the competency-based education landscape, US Government regulations, direct assessment, accreditation and stakeholder engagement, and creating opportunities for leaders, students and stakeholders of CBTE pioneer programs to share their experience and answer questions. CBTE is still a relatively new innovation, so we’ve designed the conference to generate opportunities for dialogue and networking. We know participants are coming to explore concepts, develop new programs and enhance existing ones, but we hope they will also engage each other as resources. We’re all learning and growing in this field, and this conference is a wonderful opportunity ask questions and start new conversations. We already have a diverse group of leaders signed up from schools and ministry organizations across Canada and the U.S., but there’s still room for more. More information is available at https://cbte.ca. More of this interview coming soon! Meanwhile, I hope you will consider sending a delegate from your institution to CBTE 2018.